– While playing for the Hokkaido Nippon Ham Fighters in 2009 and for the Lotte Giants of the Korea Baseball Organization in 2014, Venezuela’s Luis Jimenez developed many friendships on both teams. Because of those experiences, he has special emotions about facing the Japan and South Korea national teams in the ongoing Premier 12 tournament. Coincidentally, Venezuela, Japan and South Korea are all in Group B for the tournament’s preliminary round. From the Fighters team he played on, Jimenez befriended Sho Nakata, Atsunori Inaba, Masaru and Hisashi Takeda and Shinji Takahashi, among others, and he has fond recollections of his time with the ballclub. “I do have emotions because I know all those guys. 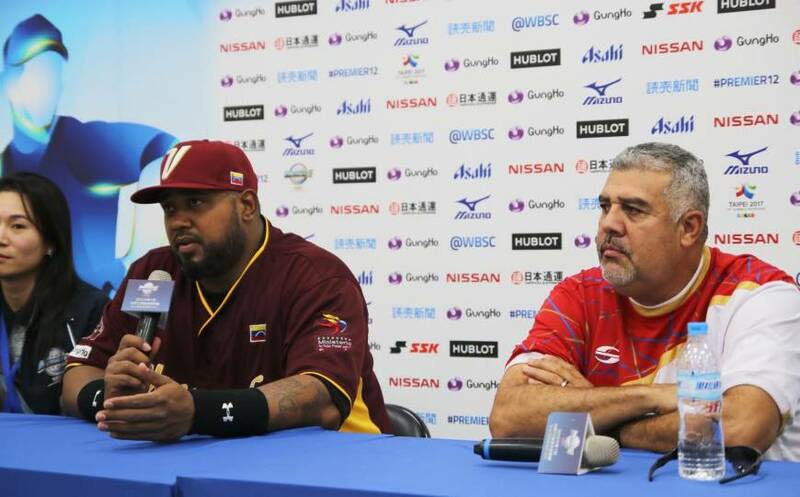 All those guys are my friends,” Jimenez, 33, said after Venezuela’s 7-5 win over the United States at Taoyuan International Stadium on Wednesday. But Jimenez flew to Taiwan with more of a warrior’s mind-set. He didn’t come to the Premier 12 to exchange friendships. Against the Americans, Jimenez had a monster game, pounding out three hits, including a two-run homer, with five RBIs and a stolen base. He added that he has more friends in South Korea because he played there more recently. Jimenez already knew that his former Fighters boss, Masataka Nashida, was recently hired as the new Tohoku Rakuten Golden Eagles manager. And the man who weighs 120 kg continued rubbing his belly. “I’ll only need to lose some weight,” Jimenez said. From the other side of the planet: While so many Japanese media members filled the press box at Taoyuan International Stadium for Thursday night’s Japan-Dominican Republic game, one Dominican reporter took at a first-row seat and wore his nation’s cap. Pedro Briceno said that he’s the only reporter from the Dominican Republic covering his nation’s actions in the Premier 12. Briceno, who works for a national newspaper called Listin Diario, actually came with the team as its publicist, too. “I’m the only reporter here, because traveling down here from our country is too expensive,” Briceno said with a laugh. Briceno also said that the six-team Dominican league championships are being held and that’s why the Dominican media remained in the country for that. Briceno, who covered the 2009 and 2013 editions of the World Baseball Classic, said that he hopes his team advances to the Tokyo round. To do so, the Dominicans need to advance to the semifinals, but even before Thursday’s game against Japan, the Dominican Republic had already dropped two games, so its chances are up in the air. Shedding the pressure: In Wednesday night’s game against Mexico, Sho Nakata was the undisputed hero for Samurai Japan. The 26-year-old went 3-for-3 with five RBIs and delivered a walk-off hit in the bottom of the ninth in Japan’s 6-5 triumph at Tien-Mou Stadium. Nakata had batted in the cleanup spot for Japan since skipper Hiroki Kokubo assumed the helm in 2013 and there was speculation before the tournament began about which slugger — Nakata or six-time Pacific League home run king Takeya Nakamura — would hit in the 4 hole. Kokubo chose Nakamura over Nakata, who hadn’t performed well when he was in the spot, for the Premier 12, and put Nakata in the sixth spot. For Thursday’s game against the Dominican Republic, Samurai Japan stuck with Nakamura as the cleanup hitter and kept Nakata in the 6 hole so the latter wouldn’t have to carry the pressure. That order presumably won’t change for the reminder of the tournament.